CDMessenger is an app from Live2Support helps users communicate in a secure, reliable, and stable environment. There is no limit to the number of users of this tool. It is utilized by small companies as well as giant corporations. CDMessenger offers a chat interface as well as productivity tools like sticky notes, event alerts, and to-do list task management. The app uses SSL security and the data is secured and stored on servers that can be accessed anywhere, anytime. A detailed review of CDMessenger prepared by our experts is also available with a thorough analysis of CDMessenger’s capabilities. The app is flexible and allows users to open the IM window and the live chat customer window simultaneously. Scheduled alerts that will go out to your team members at pre-set times. 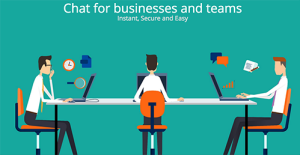 1 on 1 Chat-Messaging for team members: Communicate with your colleagues regardless of where they are located as long as they are connected to the internet. Easy to use with one-touch download and installation, CDMessenger uses cutting-edge instant messaging technology designed especially for work groups. File Transfer: Sometimes, when you need to send an important file to your colleague you can’t rely on official emailing because even after sending the email you also need to notify the person to check the email. But with CDMessenger File Transfer feature you can immediately send a file to your fellow worker without any delay. Virtual Conference Rooms: Online Conferencing (Group Chat) is the key feature of CDMessenger. The motive is to take seconds rather than minutes to start a conference without making any extra efforts. Conferencing feature can also be used as a briefing tool for departmental heads to coordinate with their teams. CDMessenger conferencing service is unique and quick in performance. You can invite multiple users for conferencing. Start conferencing with a Title, CDMessenger makes it possible for the user to give an appropriate title to each and every conferencing. Select and add members whom you wish to invite in CDMessenger conferencing. The initiator of the online conferencing can also remove any user while the conference is going on. What Problems Will CDMessenger Solve? 1. Problem: We had a team meeting the other day to finalize our marketing strategy for upcoming festive season. One of my team members, who had penned down minutes of our meetings, spilled her coffee on her notepad thus spoiling the key notes. We have no choice to call for another meeting to quickly recollect the strategy discussed and decided, losing crucial time in the process. Solution: All the chat transcripts and conference transcripts along with the messages exchanged are saved and stored for future references. CDMessenger offers you access to conferencing chat history, date and time wise. Now, there will be no chance of skipping any important point of the conference, and if needed you can read the conference notes again to clear all your doubts. 2. Problem: Generally pocket diary planners are used for reminders of important meetings and events which office executives have to attend and there are instances where events and meetings are missed because it is not always feasible to have a constant access to these planners. Solution: CDMessenger features a powerful sticky management system which enables your colleagues and you to send stickies to one another as well as to yourselves to fulfill a variety of tasks such as reminders and event alerts. Write a simple note to yourself in which you have recorded a suggestion you plan to present during your next office meeting. Paste it on your desktop as a sticky. Customize your sticky with your very own combination of rainbow colors, typefaces, and fonts. Organize your stickies into folders for easy archival and retrieval. Color-code your sticky messages and prioritize them. Once placed on your desktop, your sticky messages will remain in place even after a system reboot. 3. Problem: Conventional methods of circulating notices are devoid of delivery guarantee and there is always a huge chance of important notices being skipped by the employees. Solution: Today, many companies have their offices across the world. So, there is a dire need of a method to send urgent notices immediately and easily without any hassle. CDMessenger’s notice board feature fills that gap effectively. These notices are persistent in nature and keep popping up on the screen of recipients until and unless they are marked read and closed by the recipient. The sender of the notice can check the delivery report where the name of all the recipients will be reflected along with names of recipients who have already read it. Each business is different, and can need a specific Communications Software solution that will be designed for their business size, type of customers and staff and even particular niche they support. We advise you don't count on getting a perfect software that will work for every company no matter what their history is. It may be a good idea to read a few CDMessenger reviews first and even then you should pay attention to what the solution is intended to do for your business and your employees. Do you require an easy and straightforward service with only basic functions? Will you actually use the advanced functionalities needed by pros and large enterprises? Are there any particular tools that are especially practical for the industry you operate in? If you ask yourself these questions it will be much easier to locate a trustworthy solution that will fit your budget. How Much Does CDMessenger Cost? We realize that when you make a decision to buy Communications Software it’s important not only to see how experts evaluate it in their reviews, but also to find out if the real people and companies that buy it are actually satisfied with the product. That’s why we’ve created our behavior-based Customer Satisfaction Algorithm™ that gathers customer reviews, comments and CDMessenger reviews across a wide range of social media sites. The data is then presented in an easy to digest form showing how many people had positive and negative experience with CDMessenger. With that information at hand you should be equipped to make an informed buying decision that you won’t regret. What are CDMessenger pricing details? What integrations are available for CDMessenger?